A funny illustration but there is some scary truth contained here. The attitude of I am with you until trouble comes is destructive for race relations. What is causing the division? As the discussion about race relations in America continues, it is timely today to address the heart of the disconnect. Who is the enemy we are fighting? Is the person who has a different skin color the person you are in conflict with? Is this issue simply needing to spend more time in conversation? Those are all just symptoms of a much larger problem. The more significant problem is something no one wants to talk about. It is an enemy no one wants to acknowledge exists. That enemy lurks in the darkness. He operates in stealth mode. The Bible describes him this way. Take a step back from the emotional ties you have to this issue of race and look at the bigger picture. Make sure you are asking the right question. Who benefits most from this problem getting ramped up and intensifying? America isn’t winning. The communities that are under attack are not winning. The police who are on edge, where every decision they make is facing scrutiny, are not winning. And white America that often wants to help solve the problem but is afraid to speak out for fear of being called a racist is not winning. So all those groups seeking solutions, searching for a path forward, are lost in the midst of this tension. Maybe, just perhaps, there is a spiritual reason behind all this. As in The Screwtape Letters, we have been duped…tricked into compliance. Satan has been whispering in all our ears there is nothing to see here. Go about the business of living your life. Ignore the poor, the government will handle that problem. Forget the sins of the past, people should just move on, that was hundreds of years ago. Besides, we have enough worries of our own to deal with. Who has time to concern ourselves with the weakness of others? As the divide grew, we were ignorant to problems. It has taken riots, and police shootings to reveal the truth. But now Satan has played another trick on us. He has us looking for the wrong enemy. It is not my brother or sister of another race, gender or creed. It is you, the Father of Lies. You are the real enemy. You, Satan, are the one who is driving all this. The face of that race issue is Satan. We can’t win this battle with human resources and human weapons. Look around you. This is spiritual warfare at its highest levels. Paul does not leave us with a plan to win this war. He says you need to be properly outfitted for battle. In that same section of Scripture, he instructs us on our weapons of war. It is not what the world is using. It is not more protest. It is not more civil unrest. Lord knows we don’t need more speeches. Or more laws to be passed so they can be ignored. The good news for us is that we have all we need to win this battle. We need to be aware of who is the enemy, and the tools required to defeat him. The Holy Bible: English Standard Version. (2001). (1 Pe 5:8). Wheaton: Standard Bible Society. Jones, G. C. (1986). 1000 illustrations for preaching and teaching (p. 158). Nashville, TN: Broadman & Holman Publishers. The Holy Bible: English Standard Version. (2001). (Eph 6:10–12). Wheaton: Standard Bible Society. The Holy Bible: English Standard Version. (2001). (Eph 6:13–18). Wheaton: Standard Bible Society. ← TED Talk: What We Learned From 2,000 Obituaries? Amen!! I agree and wrote about this issue as well. Our real enemy is the father of lies, and he glories in chaos and division. Great post Keith. I thought the Screwtape Letters by C.S. Lewis was brilliant writing. Yes our enemy is probably extremely happy at the division and pain he has caused for us all. We are in this life together, but our enemy is working very hard to make sure we never understand that. Amen thank you for this thoughtful post. We are all made from one blood. There is no one more into tearing down walls than Jesus Christ. Blessings to you my blood brother! I couldn’t find a share button, but may I share a link to this post? I would be honored. Please feel free to do so. I have added a button to be able to share via email. With the bombardment of news about another racial incident nearly every day, it is difficult to focus on the root cause which you have NAILED so well. I know that I need to go to that special place of compassion and love whenever I hear about the latest unrest. Satan is using many people, black and white, to further his battle. You are so right. And you have expressed exactly what Satan wants us to do ignore me and focus on the latest incident. Thanks for reading. Your article is a very strong tie in to my bible study at Lord of Life – studying Ephesians 6 “The Armor of God” by Priscilla Shirer. Thank you for this insight that it is the crafty devil breaking us apart. Eye opening! Thank you Nancy. 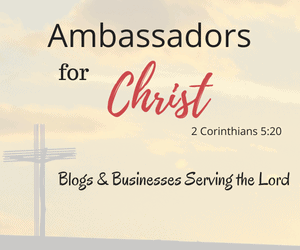 What a humbling thing to see how God is using this blog. Chills. The hairs on my body all stood up as I read this. Thanks for shedding light on a very important issue. I think if we all become aware that this is more of a spiritual battle than a physical one, we would all be able to do what is needed. Sadly with the distractions surrounding us, most fail to see it. All in all, thank you for reminding us that we already have all we need to win! So I grew up surrounded by the mentality that we blame the devil and spiritual warfare for everything. In recent years I have reacted against that, and unfortunately at times fail to see the spiritual warfare going on underneath my nose. Sometimes it is obvious and sometimes less so. My thing is, I tend to blame the fallen nature of man for everything, but that simply isn’t biblical. Thanks for the reminder. I totally agree. A couple years ago, I decided not to post anything political or negative on facebook anymore. There’s enough dividing us. I made that decision after Obama was elected the second time and some people was going nuts. Amen! In the eyes of God there is only one race – the human race. Great read, and nice thoughts/perspectives! We already won! What a glorious spot-on word. You are absolutely right! Satan is the source of it all. And complacency feeds off the conflict for sure. I’m going to re-post this on FHG, for sure. Thanks, Keith, for reminding us all of the true enemy here–the must larger picture. Thank you Steven. I wanted to get to this point earlier, but need to move people to identify the problem first. Now with some trust and credibility we can point people to who is behind all this. Thanks for reading and sharing. Go for it, my friend. I’m right there with you! I know you are and I really appreciate that support. In case you have not heard I am writing a bible study on Healing Race in America. I signed a contract with a publishing house and it should come out for sale in March 2017. Oh, WOW! How exciting! Let me know when it hits the bookstores. Thank you so much. Have a blessed day. I completely agree that Satan is behind the hate stirring up racial tensions. We know that Jehovah God is not partial, “but in every nation the man who fears him and does what is right is acceptable to him” (Acts 10:34,35). Also the great crowd of people in God’s Kingdom will include all nations, tribes, peoples and tongues (Revelation 7:9). So it is clear that no race is better than another, however, although Satan is the source we have to work to root out the negative influence that has affect all of us to come degree. Prejudice, bigotry and racism have all affected us in one way or another and we have to ask for God’s help to see people as He does. We also have to be humble enough to apologize for our own contributions no matter how small and be willing to make changes when someone points out something we’ve done that’s offensive. I saw Satan’s work on todays news. His deceived puppets were breaking windows, setting cars and trash cans on fire and throwing rocks at the police who were trying to restore order. Fortunately, the news also interviewed a real anti-Trump protester who said that all of this de-legitimises their protest. Personally, I support President Trump, but I agree that the out of control behaviour did nothing to help those who wanted to make a political point. Certainly, Satan’s influence has been behind much of our racial trouble. Sadly, some of the prominent “civil rights leaders” have been deceived. I won’t name names, but I suspect you know who they are. May God bless you for speaking truth. Yes it is said to that people are blind to how the enemy is operating. Thank you for reading and keep praying! I totally agree! This is just the enemy’s way of keeping us distracted so that we will spend less time praying and seeking God to help us tear down the walls that divide us and more time pointing fingers, playing the blame game and hating one another. Thank you for sharing! Yes and the best way to defeat the enemy is to first recognized him. Exactly! You couldn’t have said that any better. Thank you so much, you do the same!